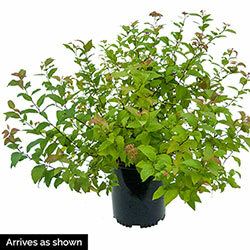 Magic Carpet Spirea - Shrubs | Buy from Michigan Bulb Co. This spunky shrub's foliage is more gold or green depending on the amount of sunlight it receives. Stays in a small mound, reaching a height of 12–24" and a spread of 24–36". Produces flat clusters of very small, pink flowers that open from summer to fall. Butterflies and bees adore this plant, but deer tend to avoid it. 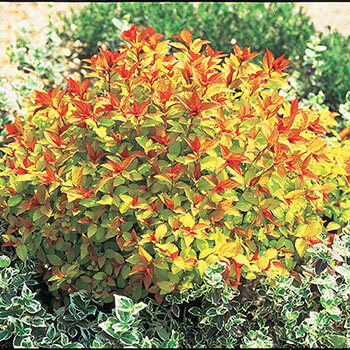 You can brighten your garden bed or border right away with Magic Carpet Spirea because we're shipping it now, already growing in a 1-gallon pot. PP09363. 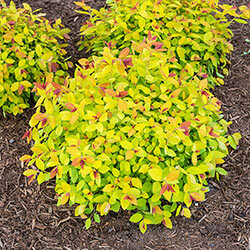 Foliage Type: young shoots and leaves are red, maturing to gold or green-gold depending on sunlight. Soil Requirements: Prefers rich, moist loams but will tolerate a wide range of soils.